steelmagnoliablog | Making my sphere of influence a better place. May grace and truth abound to all who visit here. I am reminded of two separate occurrences in college from two different strangers 2-4 yrs apart, saying they SAW the light of God’s glory in me. The very first time occurred within the first few weeks of my coming to Washington DC as a freshman at the McDonald’s on Georgia Avenue. My sister and I were sitting down eating and this lady came over with a wide smile and said “You are going to serve the Lord and it will be beautiful to see. It may not happen right away but you will really love the Lord and it will be so beautiful.” I was so scared I called my mother and told her God was coming after me, since I was not even thinking about God and church at that time. That second semester my cousin would come to visit Howard for spring break and tell us about how Jesus was the answer to all of our problems. My sister and I later gave our lives to the Lord that summer! The second time years later, I was walking home from class and just said hello as I passed a lady by and she said “Wait a minute, I see the glory of God all on you, all up in here” motioning around my head. I thought it was hilarious at first (because it WAS wacky) but because I had then given my life to Christ, I realized that not everything is by accident. At my ordination 5 years ago, something similar happened as a minister with prophetic gifting prayed for me. I realize that I am personally very uncomfortable shining – I’m more comfortable in the background. But the impression was very clear this time. Stop hiding your light- Let it shine!! It is time to really let the light of God’s glory shine through me (us) in every way. In these seeming dark times, all of creation is waiting for the manifestation of the sons(daughters) of God”, This world needs to see God’s light shining through us in all that we do – our God given gifts/talents, our God given “Let there be” creativity, our God given purpose & calling. We have the solutions because He has given us Everything to life and godliness. I first discovered this scripture Jeremiah 29:11 at an all night prayer meeting of my former church when the church was just getting started a few months after I graduated from college. I remember with great clarity when the Lord revealed this great promise to me personally, but it was a word for this new ministry barely a year old. We were mostly in our 20s, in college or just out of it and starting our careers. Our prayer ministry was about 20-25 strong on a Friday night, committed to seek Jesus and strengthen our Christian faith and fellowship. The Pastor had asked me earlier that day to prepare my heart to speak prophetically that night, and that he would let me know when to share. Well, I prayed and prayed all that day, and nothing came to me before prayer started later that night. I had to completely trust God for what He wanted to say to us. The words leapt off the page, and I knew that this was the word of the Lord for the church! As I prayed this scripture and meditated on it, the Pastor called me up about 15 min later to share what God had placed in my heart to share to our church members. It was such a great word with following instructions in the next verses. It was so powerful because we were all ready calling upon Him in prayer and this scripture let us know that He was listening! But God goes further- we seek and find Him when we search for Him with our whole heart! God wants our undivided attention. God has to “unite our hearts” so that we can worship and seek Him wholly – with our entire beings. We need His help to us stay focused, to reign in our thoughts, needs, desires and “cast down” those things that seek to exalt themselves over His word and plan for our lives. Every time I read Jeremiah 29:11 now, even 30 years later, I am reminded of my first time seeing it- how comforting and exhilarating it was to know that we are in God’s thoughts and He has specific plans for a hopeful destiny! Even though we might get confused or unfocused, God is not confused. HE KNOWS what the plan of action is. Wow! What a word for a young Christian in a young ministry. What a word for me today! As we grow older, we think we may know the plan or we may confuse our plan with God’s plan, and He has to give us course correction. We have demands of careers, family, community and life events that may pull our attention. He unites our heart and refocuses our attention back to Him. When we seek him with our whole hearts, we find Him and He unfolds His plans for our lives. He gives instructions on next steps. He gives a word of grace to bring healing and hope so that we can walk in truth and in the destiny we are called to fulfill with great excitement and joy. How open or deep are you? Does it seem that opportunity comes only just to leap out of your cup? While a little of it remains and you are able to enjoy that, it seems that the bulk of it just seems to disappear. This thought came to me just now as I started to deal with my dreaded domestic duties. I was starting to wash dishes and decided to presoak pots and dishes. The stream of water was fairly forceful as I was filling the pots with water. The pots filled rapidly but when I started filling the coffee cups most of the water just spurted out of the cups into the sink because it was not deep or wide enough to handle the flow of water that was coming out. I was immediately struck with the imagery because we often say ‘fill my cup Lord” when we should have a pot or large bowl necessary to handle the flow of opportunity, resources, grace etc that the Lord desires to give to us or flow through us to others around us. 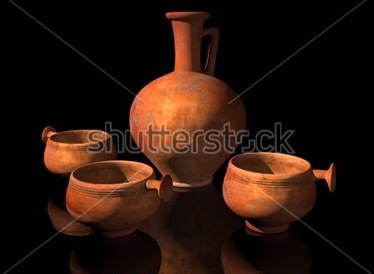 Cups are shallow – Flagons (vessels used to pour and store wine) are larger – wide at the bottom and narrower at the top to contain splash and control the flow of liquid to the cups. I know that God’s Word often talks about cups with sayings like “my cup runneth over”, or a “cup of salvation” or “take this cup away from me”. But many times when God desires to get something to us for others, He deals in vessels and flagons. But to whom much is given, much is required. Are we afraid of offering a larger vessel to God because of what we think will be required of us? Or is it because we are afraid that we will only get a fraction of what we need. Both mindsets are wrong because fear is the motivation behind each and fear is the opposite of faith. Faith is creative and opportunity driven, while fear is repressive and hinders advancement. We so often put a cup out because we only believe God deals in cupfuls, and because we are often so focused on our needs or feel this is what we deserve. But in His word, God deals bountifully with us, so that not only are our needs met but those around us are blessed too. God blessed Egypt in times of famine because of Joseph. God spared Sodom and Gomorrah because Lot was still there. The fishermen’s nets could not hold the bounty that Jesus had had wrought and needed larger nets. The widow was told to borrow many vessels (as many as she could) because once the oil started flowing it would only stop until the last vessel was filled. Another widow’s flour and oil lasted for 3 years when she surrendered it to God. Sometime the flow bypasses us because something is broken or not working properly in our lives. Just recently, I was confronted with an astronomical water bill. I had been paying it for months but it when it became too burdensome, I actually looked at the history of usage and realized for about 6 months the usage was double what it should be. I called to complain and the attendant told me that whatever caused it stopped abruptly on Feb 9 because water usage dropped down dramatically. While I was out of town, a chain broke in one of our bathrooms and it had not yet been repaired. That one bathroom was running/leaking water in copious amounts that we were paying for but had no benefit. It was just leaking down the drain. We did remember hearing what sounded like running water but just brushed it off. The inconvenience of it breaking was a blessing in disquise because it was also the cause of a major drain of resources in our pocket and the environment. WE must live more consciously and see how to keep and optimize the flow of what God is bringing into our lives. God will water proof your life, repairing the leaks and also guide you on what to you need to do. The Lord’s hand is open to us, as our hearts are open to Him and to others. Trust in the Lord with all of your heart, not just a cupful of obedience. Sometimes He wants to use you as a flagon, to pour your life into others. 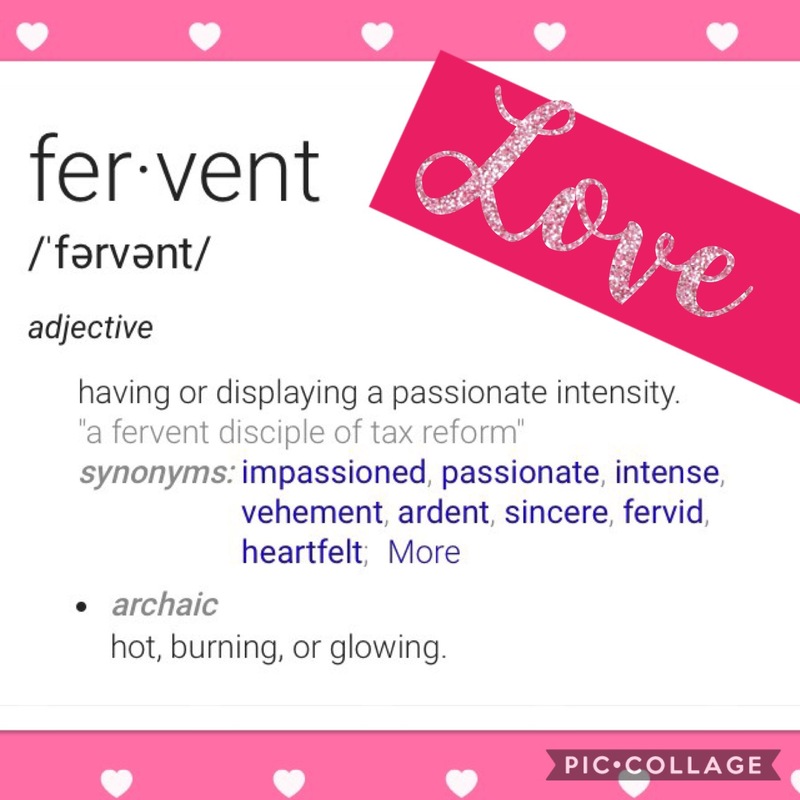 Last year on Valentine’s Day, I read this scripture and was captivated with the phrase “fervent charity” or fervent love! The scripture exhorts us to, “Above all things” over everything, HAVE fervent love, that is, display passionate intensity of love, among ourselves! FOR that love SHALL – not maybe or perhaps- cover or overlook a multitude of sin. When you are busy displaying love to your family, friends, colleagues, co-workers, neighbors, you don’t sweat the small stuff. By this shall all men know we are His disciples, the LOVE we have for one another. We love God and others because He FIRST loved us! His love never ever fails. That is why Paul prayed in Ephesians 3:17-19 that Christ may dwell in your hearts by faith; that ye, being rooted and grounded in love, may be able to comprehend with all saints what is the breadth and length and depth and height, and to know the love of Christ, which surpasseth knowledge, that ye might be filled with all the fullness of God.” We can forgive easily when we have the Love of God flowing in our hearts. It covers, indeed, overcomes, flushes out any ill-will, discontent, anger, regret and SIN in our hearts. Let’s us remember with deep gratitude, the “greater love” Christ displayed for us and let us be that conduit of grace and fervent Love to one another! Happy Valentine’s Day! Forgiveness: Free yourself- free others! Offenses are rooted in the past. When you fail to forgive you are anchored to somebody else’s transgression or personal issue. 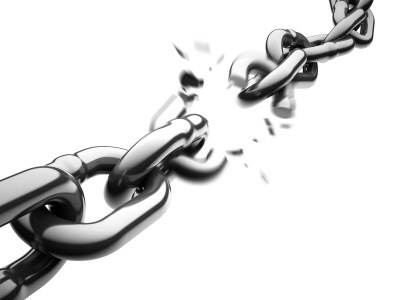 It is impossible or quite fatiguing to move forward in your future being anchored “think handcuffed” in the past. Faith looks forward. When you overlook an offense, you are jumping over a hurdle meant to slow you down. Indeed, Heb 12:1 says “let us strip off every weight that slows us down, especially the sin that so easily trips us up. And let us run with endurance the race God has set before us.” Be free! Don’t give “haters” or “frenemies” a second thought, accept to bless them as flawed vessels in need of grace. Perhaps by overlooking the offense you are freeing them too. In fact, virtue and grace abound in your own life – you are strengthened, amplified in this process (to your glory). So overlook that offense! Be free and be blessed today! As we walk in the liberating power of forgiveness, we empower others to do the same. Forgetting the past, looking ahead to embrace the high purpose and call on our lives with excellence.